(Bloomberg) -- A clerical error at J.C. Penney Co. has prompted concern that the struggling department store chain has opened the door for short-selling hedge funds seeking to trigger a default. The obscure mistake, which the company acknowledged Wednesday, has caught the attention of traders in the credit default swaps market after a series of high-profile fights over the value of the contracts. 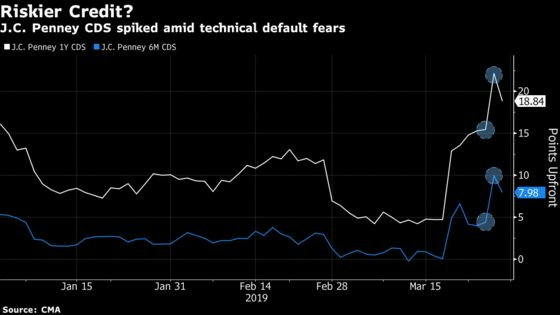 Credit derivatives tied to the retailer’s debt surged as traders fretted J.C. Penney could be faced with a situation like Windstream Holdings Inc., which filed for bankruptcy after losing a hedge fund lawsuit over a covenant violation, market participants familiar with the trading said. Traders are buying CDS protection on the company after the retailer posted an amended list of properties tied to some of its units. The changes would fix a labeling error in documents tied to a 2016 loan and likely don’t affect the company’s debt agreements or covenants. J.C. Penney reviewed documentation and recognized “some discrepancies in the stated ownership of certain interests in real estate,” a spokeswoman for the company said in a statement sent to Bloomberg. J.C. Penney didn’t transfer any properties between 2013 and 2016 and all of the properties the company was required to mortgage were mortgaged by the proper grantor, she added. In a list of properties J.C. Penney posted in 2016, the company had erroneously labeled which of its subsidiaries held 61 of those stores, said the market participants, who asked not to be named discussing private transactions. They said the corrected list shouldn’t represent a material change to J.C. Penney’s debt agreements that would require lender consent, but can have some implications for bond and loanholders if more properties are held by the same unit that issues the debt. Even if they were small, the tweaks were enough to spook the market. The cost to insure $10 million of J.C. Penney debt against default for one year jumped to more than $2.2 million upfront, from $1.5 million Wednesday before the correction was posted, according to data provider CMA. Traders fretted that if an interested lender amassed enough of the company’s $1.58 billion term loan, it could trigger a technical default by arguing the company had made material misrepresentations. Dallas-Texas based J.C. Penney operates over 860 locations across the U.S. and Puerto Rico, according to its website. The department store has struggled in recent years to keep up with changing consumer preferences. It posted $11.7 billion of net sales in fiscal 2018, down 7.1 percent from a year earlier, according to its recent regulatory filings. The company’s balance sheet shows that there’s not a whole lot of time for patience. J.C. Penney is saddled with almost $4 billion of debt, the majority of which comes due between now and 2024.